The Communicating Science (ComSciCon) 2013 workshop brought together 50 graduate students in science and engineering from across the country, along with experts in communicating science from fields including journalism, education, and even theater. For three days, the students and professionals shared effective techniques for communicating complex technical concepts to diverse audiences. Our goal was to empower young scientists to serve as ambassadors for their field. ComSciCon was sponsored by Harvard University, MIT, and the Microsoft Corporation. At ComSciCon, each student drafted an original article about an aspect of scientific research important to them. They got feedback on the piece from their peers and the experts. Meredith Rawls’ article is a standout example from the conference that goes a step further. She explores a variety of astronomy and planetary science principles while giving an on-the-ground perspective of the challenges in communicating these concepts to non-experts — in this case, students learning at a distance. Astronomers are accustomed to dealing with mind-bogglingly huge distances. But for one professor in Las Cruces, New Mexico, the biggest distance to overcome can be just a few miles. Dr. Nicole Vogt is a professor of astronomy at New Mexico State University, a land-grant university in southern New Mexico located 45 miles from El Paso, Texas. The area is largely agricultural, and many students come from nontraditional backgrounds or can get to campus only one or two days a week. Vogt teaches an introductory astronomy course that fulfills a lab science requirement for undergraduates, but students’ lives can make attendance prohibitively difficult. Some live over an hour from campus, others work a demanding job with long hours, while others have family responsibilities. When this happens, students often turn to distance education, but they come up short without a lab science. How do you earn credit for a laboratory class without, well, attending lab? The usual answer is simple: You don’t. Vogt finds this unacceptable. “Providing distance access to a core curriculum can broaden the participation of underrepresented groups in higher education,” she says. The problem is: How do you create lab exercises that can be completed without specialized equipment or face-to-face interactions with instructors and peers? The whole point of a science lab is hands-on learning. Reading a textbook or writing a paper just isn’t the same as gathering data and drawing conclusions. To address this, Vogt is developing the General Education Astronomy Source (GEAS) project at New Mexico State. Essentially, GEAS is an online astronomy course with a do-it-yourself lab built in. It is specifically designed for students to work at their own pace. They can review basic math and science skills as needed while exploring current astronomy topics. Most importantly, they are free from scheduling constraints — in both location and time. 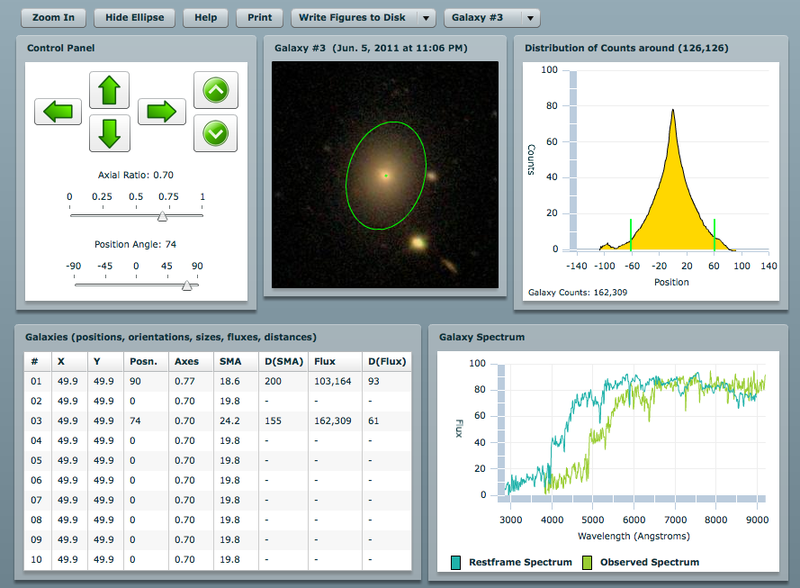 Students of the General Education Astronomy Source project also use special Web applications, like this one to analyze galaxy properties, to complete lab projects. The GEAS project is composed of four main components: an online self-review library, a set of lab exercises with accompanying videos, audio lecture recordings, and short films featuring diverse individuals with careers in astronomy and related fields. Taken together, these elements form an interactive, hands-on experience that fulfills New Mexico State’s lab science course requirement. Bringing a lab to the Internet is a unique challenge. To make a lab exercise accessible to distance learners, Vogt and her team began by adapting classic assignments to work with common household materials and a computer. “We promote hands-on learning through physical experiments that students conduct on their own,” she says. 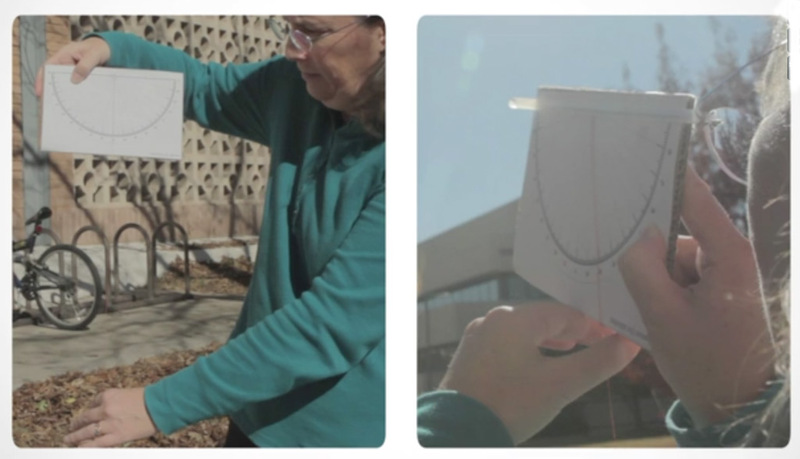 For example, to track the position of the Moon over a two-week period, students build a simple sextant — a protractor for the sky — using cardboard, pins, thread, and tape. In another exercise, students use a Web application to explore pictures of galaxies and analyze their properties. One lab is all about craters. Students learn that planetary scientists can estimate how fast a projectile was moving when it hit the Moon’s surface by measuring the size of the resultant crater. After looking at several pictures, students round up a bucket, some sand and flour, a measuring tape, and a marble. They proceed to drop the marble from various heights and make their own craters to investigate the relationships between drop height, projectile speed, and crater size. Developing projects that can be done at home, however, is only the first step in a successful do-it-yourself lab. What if students don’t understand the instructions? What if they make a mistake but don’t realize it? What if they get frustrated or have a question? In a traditional lab, the instructor can provide assistance and feedback in real time. There is no such luxury in distance education. Dr. Nicole Vogt demonstrates how to use a homemade sextant in one online lab video tutorial. In practice, Vogt’s most common response to student inquiries is, “Watch the video!” She has worked with a film crew to create a series of videos that accompany the labs. Each begins with a short background and motivation for the experiment, and then shows a group of students working through it step by step. Student reception to the videos has been overwhelmingly positive. To keep tabs on student progress, Vogt uses Google Drive, an online utility that allows collaborators to view and edit documents in real time. Each student keeps a lab report document where they record data and answer questions. The collaborative nature of Google Drive lets the instructor see student responses before an assignment is due. This effectively mimics the instructor-student interaction in a traditional lab course. For instance, if a student mistakenly concludes that faster projectiles make smaller craters, the instructor can leave a comment to ask if there was a problem performing the experiment. Vogt points out that GEAS is a work in progress but has come a long way. The unique format of the lab exercises can present a daunting learning curve, as many students are used to online courses requiring little work. That said, students who persevere through the first couple of lab exercises typically come away with an appreciation for how much they have learned.